Well this was just a heck of a lot of fun. “Damnation,” is a lot like what the Christian church-goers might refer to as “Purgatory” – that place in-between the land of the living and either heaven or hell. But with a twist. Those arriving in Damnation have a past that’s checkered with some foul deed or another and it’s pretty well-assumed that those who move on from Damnation will only go in one direction. But those arriving in Damnation, which resembles an old west cowpoke town, don’t have to leave. If they can stay ‘alive’ they remain in Damnation. But get killed a second time and it’s out-of-town for the poor soul. Our story is told primarily from the point of view of a man whose stayed out of trouble since arriving and even started his own Damn newspaper, keeping the residents apprised of the comings and goings of all the other residents. Just in case the purgatory of the afterlife isn’t supernatural enough for the reader, Damnation also has its vampire residents and some werewolves who invade the town from time to time. The vamps and the wolves are just as subjected to being ‘killed’ and moving on to their final destination as the humans. I was expecting something a little more … cheesy, I think. Something that was more along the lines of spoof or farce, but instead we actually get a good mash-up of two unlikely genres – the western and the paranormal. There wasn’t anything here too serious, but the story was strong enough to capture my attention and to hold my interest. What Damnation is, or was, was nicely, slowly revealed, though there are still some questions about the place and why people arrive or don’t and where they go afterward. I had fun in Damnation and I’m hoping there will be more stories there to take me back. Looking for a good book? 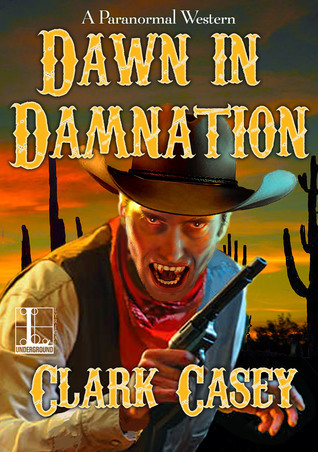 Dawn in Damnation by Clark Casey is an entertaining read and a nice blend of paranormal/fantasy and old-fashioned western.